"This is probably the most unusual 'pizza' you'll ever see! It's a great dessert for kids, although adults snap it up, too. Everyone loves the chewy crust and the great flavor. Chocolate and peanut butter are a nice combination." In a mixing bowl, cream shortening, peanut butter and sugars. Beat in eggs and vanilla. Stir in flour and mix well. Pat into a greased 12-in. pizza pan. Bake at 375 degrees F for 12 minutes. Sprinkle with the marshmallows and chocolate chips. Return to the oven for 4-6 minutes or until lightly browned. The cookie dough was too soft and fell apart. 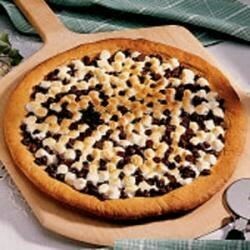 The marshmallows made the pizza very difficult to slice, so the pizza turned into a big mess. VERY Yummy! Thank you for the great idea.